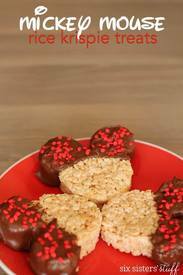 My kids love rice krispie treats! When we were at Disneyland last October, the Mickey Mouse Rice Krispie Treats were their favorite treat to get in the park! I figured it would be pretty simple to recreate them at home and my kids had so much fun helping me cut out the treats, dipping them in chocolate and covering them in sprinkles!